By Leila Ueberschlag, December 6, 2016 at 2:10 pm . Ruth Catlow (artist and curator) and Ben Vickers (curator, writer, and technologist), brought the LARPing tradition to MoneyLab in this special workshop ‘Role PLay Your Way to Budgetary Blockchain Bliss’. Unsuspecting participants were assigned characters – generic roles that frequent the business cycle of start up tech companies trying to make the next big thing with the latest technological innovation. The only twist was that this 2-day start up tech hackathon was aimed at creating Blockchain based businesses ideas that improve the life and future of cats. For this role-playing workshop, each participant was assigned a cat-invested persona and the general goal of networking their way into a profitable enterprise for themselves, the cat community, and the hosting institution. The workshop critically emulated the extravagant discourse and excitement surrounding the super-automation and hyperconectivity that comes with blockchain and similar technologies, and the capacity of the technology stakeholders to both increase and diminish global inequity. 1. “Fully Automated Luxury Utopia for Cats”, by the Autonomous Cat Society, envisions a great future for a catkind emancipated from humans, where they are able to thrive without people. The leader of the society made clear that he and the project is nothing but a cat-alizer to return the now forgotten divine status of felines. 2. “Cats you can trust” is a blockchain-based project seeking to clarify the provenience of purebred cats. A cryptographic unforgeable record would effectively separate pure cats from the untrustworthy half-bred. The project would make use of automatic pattern recognition and record every cat at the moment of birth to present an unbreakable proof-of-heritage. 3. “Cat roulette” tries to funnel the profitability of the gambling market towards cat welfare. By using webcams in cat houses, everyone would be able to bet online on their behaviour. It gets rid of machine, algorithm, and human intermediaries to bring true randomness to the gambling community. A percentage of the profits of this autonomous decentralized casino would be donated to cat welfare. 4. “Strokes for hire” uses state-of-art technology to harness the love of humans to cats. A clever design of the Proof-of-Purr (PUP) algorithm, generates tokens every time a cat is petted. A negotiable percentage of the money generated would go back to the cat owners. Thus, the feedback design of the project enhances cat care by providing a benefit stimulus. 5. Finally, “Kittycoin” has a simple yet elegant pitch: dogs have their own cryptocurrency (Dogecoin), cats and kittens deserve their own too. The cryptocurrency is transversal, it can be used by and for other projects, and has marketing already built-in: it exploits the fact that cats, and not dogs, are the original animal of the internet. The project is confident on the universal acceptance of their ‘lolcat’ strategy. The rest of the first day gave chance to the multiplicity of attendees to ask, negotiate, and offer their skills to their favourite projects. It became rapidly clear that the diversity of the audience had different motivations, skills, and ideologies. Each participant performed a part of the complex ecosystem of fintech and start-ups: investors, developers, experts, scholars, and naive enthusiasts had the difficult task to sort out differences in order to build up lasting and successful alliances. Everyone had something to invest (time, energy, money, venues, a van full of cats) and something to get in return (profits, cat life improvement, patents, philanthropy aspirations). The groups discussed their plans to get the projects going: contracts design, distribution of wealth, mission statements, specific tokens, DAO’s and cat-friendly computing technologies to use. Finally, the groups presented their final pitch and the results of their collaborations. “Cats you can trust” managed to generate lots of “smart” contracts and using purecatcoin, this group was without a doubt the most developed one and almost ready for implementation. “Cat Roulette” was taken over by three investors, who at the end of the day had 60% of the company’s shares. While the distributed gambling project ended up as quite profitable, no money generated was allocated for cats. “Strokes for hire” chose ‘purrtokens’ as their currency and managed to diversify their initial market: the stroke tracking not only allowed them to mine tokens, but also to gather health data and get into into the health benefits business. It is worth mentioning that this group was the only one that remembered to give part of their earnings to the Catteresea, while generously distributing their revenue to IT needs, investors and users. The prize for the best group went for the merging of “Kittycoin” and the “Autonomous Cat Society”. The latter managed to get completely funded and adopted the former as their official currency. Overall, the workshop was a remarkable exercise of role-play networking, which showed the tension between different ideal scenarios, but also the commitment to come to terms in order to develop a project. 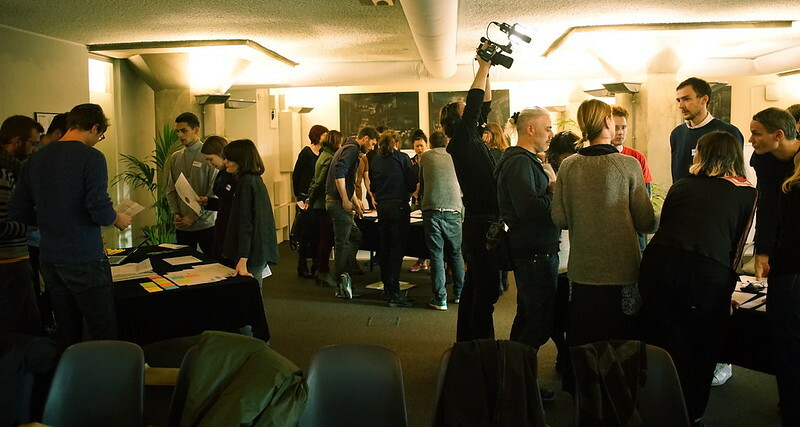 The playful setting got participants seamlessly involved with their personifications, and exceptionally showed how a micro-cosmos of diversity manages to generate social relations, contract codes, and socio-technical arrangements involving blockchains and similar devices, in a mist of ethical debates, interest-driven governance, and solidarity.